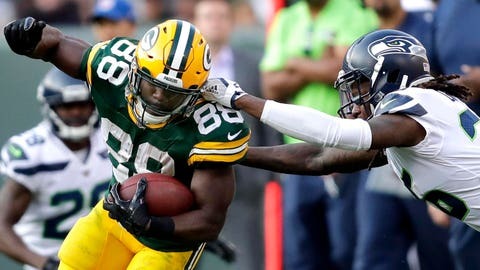 Converted wide receiver Ty Montgomery’s spot atop the Green Bay Packers backfield appears to be secure. Montgomery was on the field for a whopping 90 percent of the Green Bay’s offensive plays in Week 1. Of the Packers’ skill-position players, only Aaron Rodgers and Jordy Nelson were more involved. He made the most of the assignment, rushing for 54 yards and a touchdown on 19 carries and catching all four passes thrown his way for 39 yards. The rookies, by comparison, were nowhere to be found. The Packers made the position a priority in last summer’s NFL draft, selecting BYU standout Jamaal Williams in the fourth round, and adding two more backs in later rounds. Williams was the first running back picked by the Packers since Eddie Lacy in 2010, while Green Bay hadn’t used three picks on the position since 1974. The net result of those three picks in Week 1? Six plays, two carries and nine yards. Montgomery got more work against the Seattle Seahawks than Lacy did in any of his five appearances last season. Lacy, now with the Seahawks, peaked at 70 percent last season in Week 3. — Randall Cobb had the lightest workload of the Packers’ top three receivers but was by far the most involved, drawing 13 targets despite appearing on 77 percent of the Packers’ offensive plays. He finished with nine catches for 85 yards. — Martellus Bennett’s involvement has, as expected, pushed fellow tight end Richard Rodgers out of the picture almost entirely. Rodgers was on the field for just five plays in Week 1 after appearing on 55.4 percent of their offensive plays last season. — Tight end Lance Kendricks was on the field for just 21 plays but was also involved on offense, drawing four targets and finishing with two catches for 18 yards. — Rookie cornerback Kevin King was on the field for six defensive plays. — Nose tackle Quinton Dial was inactive a few days after signing with the Packers as a free agent.